What’s the best base for topical vitamin C? If you've ever gotten a bad sunburn, you probably know that one of the best ways to bring relief to your burning skin is by applying aloe vera gel. People have used aloe vera for centuries to help with everything from wound care to laxative needs. It works so well in part because it has over 75 active ingredients. And studies on some of these 75 active ingredients give us plenty of evidence that aloe vera shouldn't just be something you store in the back of your refrigerator in case you forget to reapply sunscreen. Take for instance a study published a few years ago in the journal Organic and Medicinal Chemistry Letters. In this study, the researchers investigated and quantified a number of these benefits. The researcher found that aloe vera has significant antioxidant capacities, in part because it is full of polyphenols and flavonoids. This allows aloe vera to help your skin repair itself from the damage the sun can cause. We know that premature aging, also known as photo aging of the skin, is most often characterized by wrinkles and unwanted pigmentation. In well done, scientific studies, aloe vera has exhibited the exceptional ability of reducing photo damage. 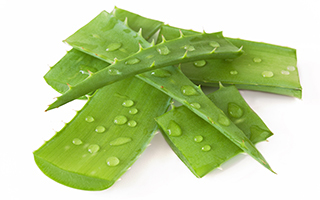 Research has shown that aloe vera protects and maintains the integrity of the skin membrane at a cellular level. Even better, aloe vera pairs antioxidant capacities with antibacterial effects. In another study, the researchers found that aloe vera can inhibit the growth of a number of different strains of bacteria. This means that aloe vera can be helpful in fighting off infections, which is one reason it was effectively used for wound care long before the advent of modern medicine. When we were developing Système 41, we thought long and hard about the most effective and safest ingredients to use. We knew we wanted to develop a vitamin C serum that would give us all the benefits of vitamin C without the dryness. We decided upon an aloe vera and hyaluronic base. This unique combination gives you the benefit of vitamin C, the antioxidant and restorative protection of aloe vera, and the strong moisturizing effect of hyaluronic acid. I think of it as an anti-aging triad. This has proven to be remarkable. Not a week has gone by since we released the serum that I have not received dozens of emails thanking us for the anti-aging triad. During the winter months, our skin tends to become dehydrated. Consider reaching for the luxurious nutrient dense Vitamin C Serum for tone correction, hydration, and skin restoration.